Blue Sky Pressure Washing is your Eco Friendly company in New Hampshire & surrounding communities of Concord, Nashua, Manchester & Portsmouth area! Call Blue Sky Power Washing in Masssachusetts for a Quote for your roofing “ugly shingles”, vinyl, asphalt, pavement, & clapboard Cleaning! No.The Blue Sky solution we use is a powerful cleaning agent that is Eco friendly;, but we go to great measures to rinse down all plants and grass surrounding the house before, during, and after the application. The result is that any detergent over-spray or runoff is completely diluted. You may even notice that your landscaping in these areas looks especially green and vibrant in the days following the cleaning due to all the watering! No. We can inspect your home washing needs and provide a written estimate through email within 24-48 hours of your phone call., You do not have to be home for the cleaning either, but before you leave please bring pets inside, make sure all doors and windows are closed securely, unlock any gates, and move your vehicles into the garage or out to the street. We will need to use your exterior water spigots during the process, so please make sure that we have access to them. Those dark stains on your roof are algae., The textbook name for this type of air borne algae is Gloeocapsa Magma. Gloeocapsa magma is found in warm humid environments and often appears on the North side of the home and under trees. The reason that it is usually seen on the North side of the home is because; the north side gets the least amount of sun which causes this area stay wet longer than the others. Gloeocapsa Magma also, forms under trees because of the shade and the fact that when trees drip water after it rains, it keeps the surface wet longer. 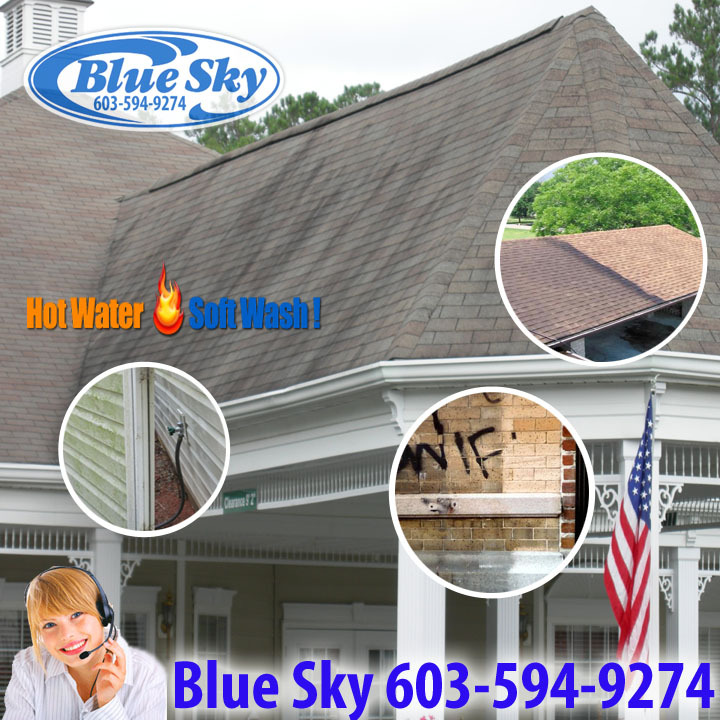 Click2Call Blue Sky for a Free Quote!